Indian menus can be intimidating. Without a ton of familiarity, it’s easy to settle for perennial favorites like butter chicken and samosas. But playing it safe with Indian food is a huge mistake; it’s a country with 29 different states, each with its own signature dishes and cuisine. And the good news is, you don’t have to sit on a 15 hour flight to experience them -- many of the best Indian dishes can be found in different neighborhoods across New York City. For years, Little Bombay in the East Village, and Jackson Heights, in Queens dominated NYC’s Indian food scene. These days, most of it is concentrated in what’s known as Curry Hill, a stretch of Indian restaurants along Lexington Avenue in Murray Hill, and across the river in Jersey City -- but in the last year, NYC has also seen a crop of new trendy Indian restaurants that skew slightly more upscale, like Babu Ji, Indian Accent, and Paowalla. Below are the 10 dishes you need to add to your Indian food repertoire ASAP -- from pav bhaji to rasgulla -- and exactly where you can find the best versions. Chef Jesse Singh offers an impressive lot of Punjabi favorites, the standout being his version of a yogurt kebab -- a dish you truly can't find anywhere else in New York. While the idea of turning yogurt into a kebab-like dish might sound impossible, the end product is a beautiful, crunchy yet creamy vegetarian appetizer that’s bursting with color. To make it, Singh strains yogurt that’s been mixed with fresh green chili and green cardamom powder. 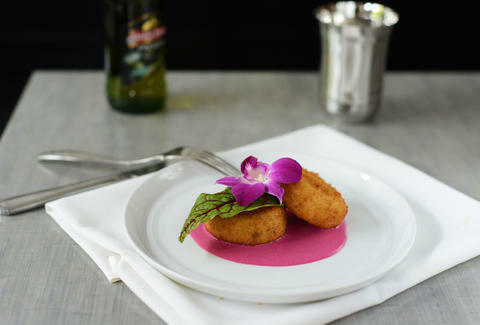 The hung yogurt is then pan-fried and served over a bright pink sauce made from beetroot, green chili, and fresh ginger. Curry Hill, the stretch of Lexington Ave that runs straight through Murray Hill, is nicknamed as such because it's rife with Indian restaurants -- the best of which may be Dhaba. 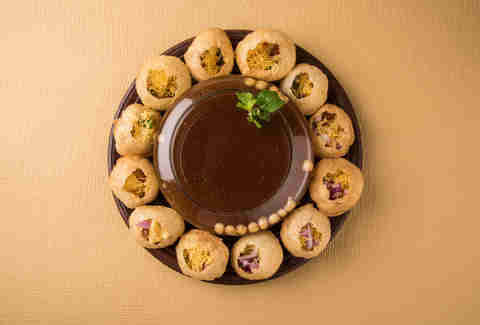 The restaurant, which translates to “roadside stall,” serves a large menu of Punjabi dishes like makki di roti (a flat cornbread) and unda -- or egg -- curry. 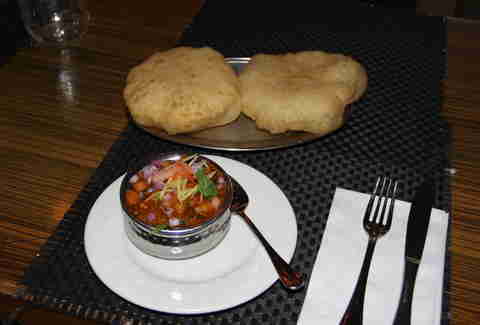 While those are both absolutely worth ordering, do not pass on a plate of Dhaba’s Chole Bature: chickpeas cooked in a spicy tomato gravy served with a deep-fried flatbread (bature). Dhaba’s version is puffy and just the right amount of greasy, especially when you get it fresh from the fryer. This tiny West Village spot may be best known for its nizami roll -- a new spin on the popular kati roll (a street-food dish that features a kebab wrapped in a flatbread known as paratha) -- but the absolute best thing on the menu is the bhel puri. Served casually in small silver takeout containers, the cold snack dish resembles a savory, cold Rice Krispies salad, made the traditional way with crispy puffed rice tossed with raw onion, tomatoes, and two kinds of chutney. Wash down the dish with cup of the restaurant’s chai (it’s one of the best in the city). It’s worth braving the throngs of Midwestern tourists and Sesame Street characters to get your hands on some of Utsav’s lasuni gobi. Served up in a swanky, very-Times Square setting (no matter), the dish -- which translates to garlicky cauliflower -- is kind of like a vegetarian take on crunchy chicken wings. 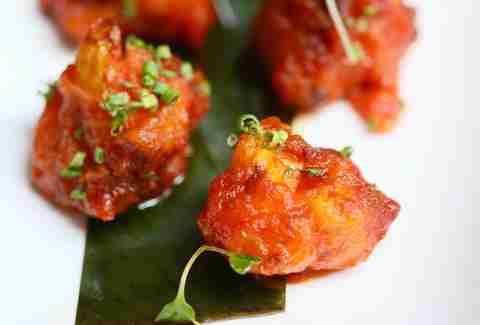 Chef Hari Nayak coats cauliflower florets with a spiced tempura batter before deep-frying them, then tosses the fried florets in a tangy garlic/ginger/tomato sauce in a searing-hot wok. The result is a bright orange snack that’s guaranteed to change your opinion on vegetables. Haldi is a more recent addition to Curry Hill, offering a seriously huge menu that has everything from British Indian favorites like chicken tikka masala to Indo Chinese specialities like chili paneer -- but the malai kofta is undoubtedly the MVP. It’s a creamy, mild curry that features deep-fried balls of potato and paneer with a drizzle of cream on top, and it's best mopped up with some of Haldi’s super-fresh naan. 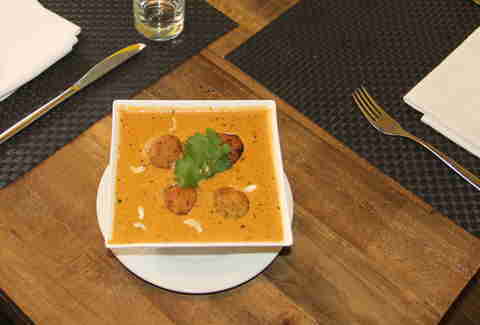 The dish is perfect if you’re looking to expand your horizons beyond butter chicken, but don’t want to venture too far into the unknown. Nearly every culture has a dish that was created to use up leftover bread (bread pudding and croutons, to name a few). In South India and Sri Lanka, it’s kothu parotta, which consists of chopped-up parotta (a layered flatbread) that gets stir-fried with vegetables, curry, eggs, and sometimes meat. The result is a hearty bowl of spiced and flavorful carbs that can easily function as a complete meal. Kottu House is a Sri Lankan spot on the Lower East Side that offers a number of variations (for a reasonable price) -- including one made with chicken -- but the must-try is the pineapple, which is cooked down with coconut milk and fragrant spices. 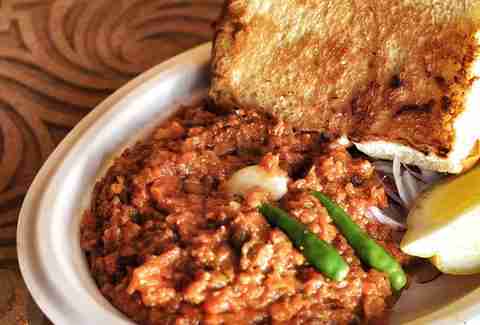 Often dubbed the Indian “sloppy Joe” (it literally translates to “bread and vegetables"), pav bhaji is a wildly popular dish that originated in the streets of Mumbai. Its nickname is a bit misleading, as it’s a totally meatless dish -- but everything else about it will remind you of that beautifully messy middle school lunch: mashed vegetables like potatoes and peas simmered in a flavorful gravy and served with extra-buttery buns that have been crisped on a griddle. Masala Times’ version is served extra hot and comes with a heaping pile of chopped raw onion and lemon wedges for an extra punch of flavor. Just bring some breath mints for after if you plan on speaking to anyone after. The menu skews more upscale at Indian Accent’s first New York City outpost, where you’ll find an innovative, prix fixe-style menu featuring the likes of black pepper pork with curd rice and duck chettinad. The real star of the menu, though, is the black dairy dhal: a silky, satisfying dish that features lentils cooked with tomatoes, dried fenugreek, and spices -- all finished off with lots of cream and Indian butter. The dal is served with kulchas (or stuffed naans) which are filled with everything from from classic things like butter chicken to non-traditional items like pastrami (a nod to NYC’s beloved deli meat). Desi Galli is NYC's haven for chaat -- a saucy, spicy, crunchy Indian style of snack foods that are usually loaded with chutneys and feature at least one item that’s fried. There are multiple cheap and cheerful options to choose from including dishes of samosa chaat (essentially samosa nachos) and vada pav (a sandwich featuring a crispy potato patty), but if for some reason you choose to only get one, it has to be the pani puri. While they’re traditionally served one piece at a time from a street-side stall, Desi Galli serves up a plate of crispy, puffed mini puris stuffed with spiced potatoes, topped off with tamarind chutney, and finally dunked in a bowl of fragrant water seasoned heavily with cilantro and mint. Be sure to eat them in one bite. Located in the basement of a Hindu temple in Flushing, this no-frills canteen is a hidden gem for cheap, vegetarian Indian food -- specifically the city’s best dosas. The go-to order here is the most classic dosa type -- the masala dosa. It’s a crepe-like dish stuffed with potatoes that are spiced with turmeric and sautéed with onion and mustard seeds, and it’s served alongside overflowing paper bowls of a spicy lentil soup called sambar for dipping. Silverware isn’t necessary -- the only way to eat a dosa is to tear right into it with your hands. This tiny Jackson Heights store offers a number of savory Indian dishes like pav bhaji and a variety of chaats. 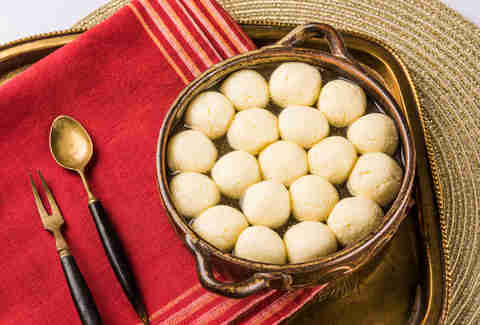 But it’s best known for its dessert section, which is packed with authentic Indian sweets like rasgulla, a dessert that originates in East India and consists of spongy round dumplings made from semolina and soft cheese that get soaked in a sugar syrup. The dessert is sold by the pound, and while that’s technically way more than a single serving, at $8.99, it’s cheap enough to not have to share. There’s eggs on toast, and then there is eggs Kejriwal -- the latter being a zippy, spiced-up version of the former, starring toasted bread topped with a sunny-side-up egg, melted cheese, and plenty of green chile. As the story goes, the dish is named after Devi Prasad Kejriwal, a member of the Willingdon Sports Club in Mumbai. Kejriwal allegedly had such a penchant for eggs -- a no-no at the strictly vegetarian club -- that the chefs hid his eggs beneath the cheese and chiles. Floyd Cardoz’s version at the recently opened Paowalla is a spiffed-up take on the kind served at cafes in Mumbai. He swaps plain white bread for a squishy brioche, and nixes the processed Amul-brand cheese for cheddar mixed with chopped serrano chiles. The whole dish gets topped off with a spicy green chili chutney for an extra kick. Khushbu Shah is a food writer and photographer who dreams of opening a samosa shop one day. Tweet her your favorite Indian dishes @khushandoj.